Morecambe boss Jim Bentley admits one eye is firmly on next season as the Shrimps enter the final five games of the campaign. Bentley is due to sit down with chairman Peter McGuigan to finalise his budget with targets already lined up. 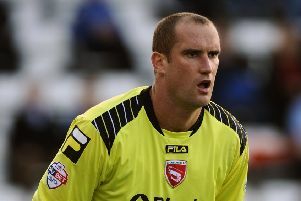 The Shrimps boss said: “I’ve had conversations about other players at other clubs. “We’ve got a couple of targets we’ve identified for next season but I’ve got to sit down with the chairman over the next week or two and iron out what we want to do and where we want to go and what the plan is with regards to the budget. “When you get that sorted you can start putting the pieces into place and that’s what we’ll do. “Every summer at football clubs, some stay and some go, that’s the way it is. “Looking towards next season you’ve got to have a hit list and we’ve certainly got one. Bentley and McGuigan will be at a fans’ forum at the Globe Arena on Thursday night. The evening starts at 7.30pm in the Globe Bar.